Physically Abled: 40% or more disability. Passed 12th or equivalent examination with 50% marks (45% for SC/ST). 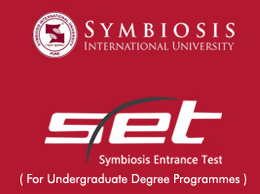 Note: Indian eligible students will be admitted to Symbiosis on the basis of the merit list drawn out of the results of the selection process through SET 2019 and PIWAT. Proof: A certificate issued by a Medical Superintendent/ Civil Surgeon of a Government hospital has to be submitted to prove that the candidate belongs to that particular category to satisfy the eligibility criteria for SET 2019. Certificate Verification: The disability certificate shall be verified/certified by Symbiosis Centre for Health Care (SCHC), Pune, for admission under this category to satisfy the eligibility Criteria for SET 2019. Admissions: A student having any of the following disabilities with minimum 40% of damages can claim admissions and can satisfy eligibility under this category for SET 2019. Cerebral palsy: Cerebral palsy means a group of non-progressive conditions of a person characterized by abnormal motor control posture, resulting from brain insult or injuries occurring in the prenatal, perinatal or intent period of development. Orthopedically handicapped: All the cases of orthopedically handicapped persons would be covered the category of locomotor disability or cerebral palsy. Low vision: Persons with low vision means a person with impairment of visual functioning even after treatment or standard refractive correction but who uses or is potentially capable of using vision for the planning or execution of a task with the appropriate assistive device. Hearing Impairment: Hearing Impairment means loss of sixty decibels or more in the better ear in the conversational range of frequencies. Seats: In case some seats remain vacant due to the non-availability of suitable and eligible candidates in the category of reservations then information about the number of vacant seats in each category will be reported to the Symbiosis International University and with the permission of the Vice-chancellor, the seats will be reverted to the general category and short-listed eligible students will be offered these seats. A student is eligible to apply as a Foreign National (FN) if he/she is a citizen of any country other than India and holds a foreign passport. As per the Government of India notification dated 9th January 2015, all the existing Persons of Indian Origin cardholders registered as such shall be deemed to be Overseas Citizens of India cardholders. A student is eligible to apply as OCI if he/she is granted with Overseas Citizenship of India and has an OCI card. No Common Entrance Exam is applicable for UG Programmes offered by SIHS and SCON. Standard XII (10+2) passed from any recognized board with minimum 45% marks or equivalent grade (40% marks or equivalent grade for Scheduled Caste/Scheduled Tribes). Standard XII (10+2) passed from a recognized board with Physics and Mathematics as compulsory subjects along with one of the Chemistry/ Biotechnology/ Biology/ Technical Vocational subject. Obtained at least 45% marks (40% in case of candidates belonging to Scheduled Caste/Scheduled Tribes) in the above subjects taken together. a) Passed Diploma examination from an AICTE approved Institution; with at least 45% marks (40% in case of candidates belonging to Scheduled Caste/Scheduled Tribes) in appropriate branch of Engineering / Technology. b) Passed B.Sc. Degree from a recognized University as defined by UGC, with at least 45% marks (40% in case of candidates belonging to Scheduled Caste/Scheduled Tribes) and passed XII standard with mathematics as a subject. c) Provided that in case of students belonging to B. Sc. Stream, shall clear the subjects of Engineering Graphics / Engineering Drawing and Engineering Mechanics of the first year Engineering program along with the second year subjects. d) Provided further that, the students belonging to B. Sc. Stream shall be considered only after filling the supernumerary seats in this category with students belonging to the Diploma stream. e) Provided further that students, who have passed Diploma in Engineering and Technology from an AICTE approved Institution or B. Sc. Degree from a recognized University as defined by UGC, shall also be eligible for admission to the first year Engineering Degree courses subject to vacancies in the first year class in case the vacancies at lateral entry are exhausted. However, the admissions shall be based strictly on the eligibility criteria as mentioned in A, B, C, and D above. A candidate who has completed qualifying qualification from any Foreign Board / University must obtain an equivalence certificate from Association of Indian Universities (AIU). SET 2019 application form can be filled only if the candidate satisfies the SET 2019 eligibility criteria. SET 2019 details of eligibility must be read by the candidate if he/she belongs to a reservation category. SET 2019 exam syllabus should be strictly followed by the candidate as missing out on topics will result in loss of marks. Can you please mention the requirement for NRIs? What is the qualification criteria for sse? The standard XII (10+2) or equivalent examination passed from any recognized board with minimum 50% marks or equivalent grade (45% marks or equivalent grade for Scheduled Caste/Scheduled Tribes) is the eligibility criteria for SSE. I have completed my schooling from NIOS. Can I fill the application form? Yes, you are eligible to apply for the SET 2018 examination. To know more about the eligibility criteria, click on the link here. What is the eligibility criteria for the BCA course? The candidate should have passed their standard XII examination or an equivalent examination. The candidate should have a diploma in engineering or technology with minimum of 50% marks (45% for SC/ST candidates). What is the eligibility criteria for the B.Tech course? Candidates from the reserved category should have passed 10+2 examination and obtained atleast 40% marks. May I know what are the Categories on which a candidate can apply for Differently abled? "Blindness" refers to a condition where a person suffers from any of the following conditions namely : Total absence of sight or Visual acuity not exceeding 6/60 or 20/200 (Snellen) in the better eye with correcting lenses or Limitation of the field of vision subtending an angle of 20 degree or worse. Is there Reservation available for differently abled candidates in SET 2017? A student having disabilities with minimum 40% of damages can claim admissions and can satisfy eligibility under Differently abled category in SET 2017. May I know the basic Eligibility for a NRI candidate to appear in SET-2017? He/She has appeared for either the 10th or 10+2 (equivalent to the Indian 10th (SSC) & 12th (HSC)) examination outside India. Is there any age limit to apply for any of the institutes under SET? Yes, Symbiosis Law school has an age limit.